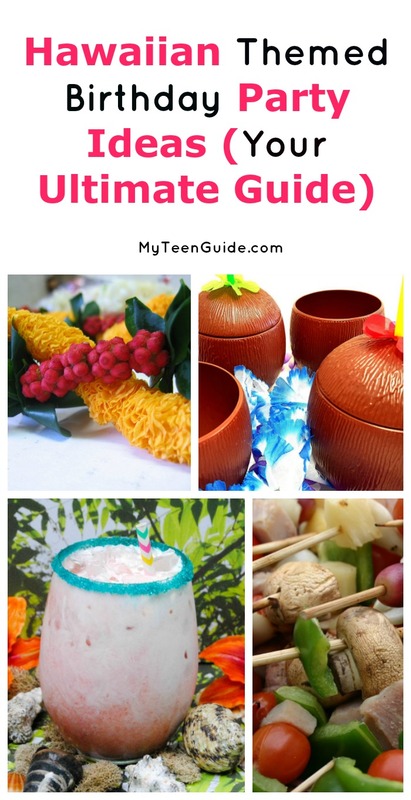 If you are stumped when it comes to coming up with a cool, hip theme for your upcoming celebration, how about a Hawaiian themed birthday party? A Hawaiian themed party mostly focuses on tropical décor, Hawaiian-inspired foods and fun activities. While it’s absolutely perfect for a summer bday, with our tips you can pull it off any time of the year! Read on to see how to put it all together! Don’t miss out: Shop Now and Get Free Shipping On Orders $69+ Use Code: FREE69! So, you’re planning this huge Hawaiian bash, right? Well, you need to tell everyone about it, so they can attend! You have a few choices when it comes to sending out invites to your Hawaiian themed birthday party. Let’s check them out! I love these Hawaiian Luau party invites from Amazon. You get 50 in the pack and they’re easy to customize with your party details. For those of you with a creative side, consider making your own party invitations. This article provides you with easy, step-by-step instructions for creating Luau Flip Flop Invitations. 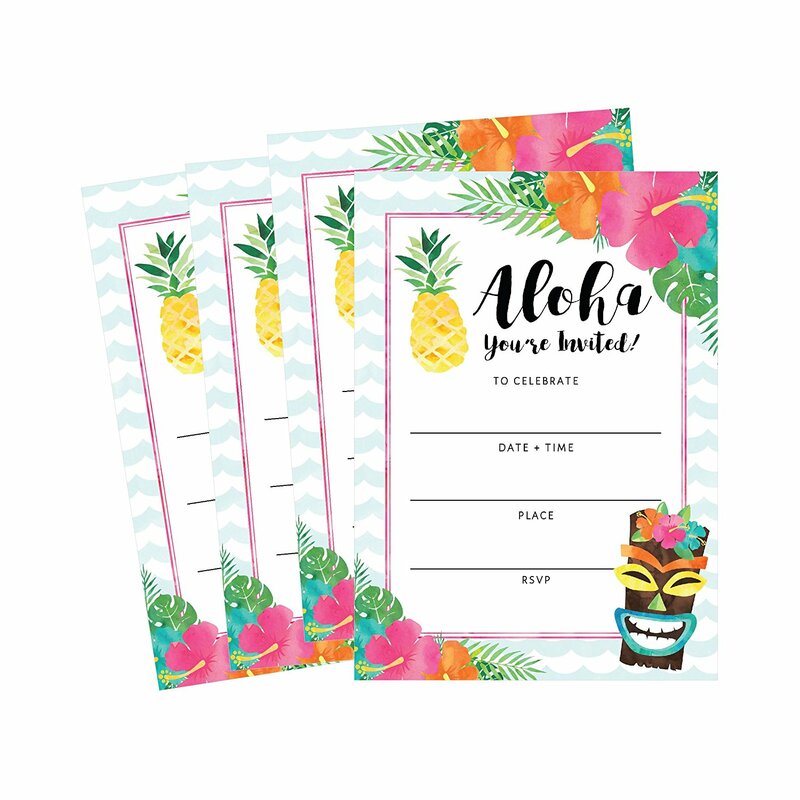 Canva also features an assortment of party invitations, which can be customized and printed out, including Colorful Palm Leaves Tropical Luau Invitation and Luau Party Pineapple Tropical Invitation. If you’re on a tight budget, you can also just send a text to all your friends with the party details. Just do it individually and not as a group text. I know it drives me nuts when my friends group-text me, then I get buzzed for every single RSVP, question, etc. By the day of the party, then info I need is so buried that I end up texting the host asking for the details again! When it comes to Hawaiian themed birthday party, you want to pay extra attention to the decor. While you don’t have to spend a fortune, the right decorations can really bring home the theme! Here are some easy ideas! Grab some pineapple balloons and a home helium kit . Put balloons on the tables as centerpieces, hang them from the ceiling, and let some free-float around. You can also grab some pineapple hanging lanterns . You’ll need a place to keep drinks cool! Grab this Inflatable Palm Tree Cooler to really make a statement! Don’t forget the Tiki torches ! Order them online in bulk, or, if you have a Party City near you, they usually have super cheap torches. When it comes to tableware for your party, think tropical! Amazon has some great Luau party tableware sets, including this complete set with everything you need! 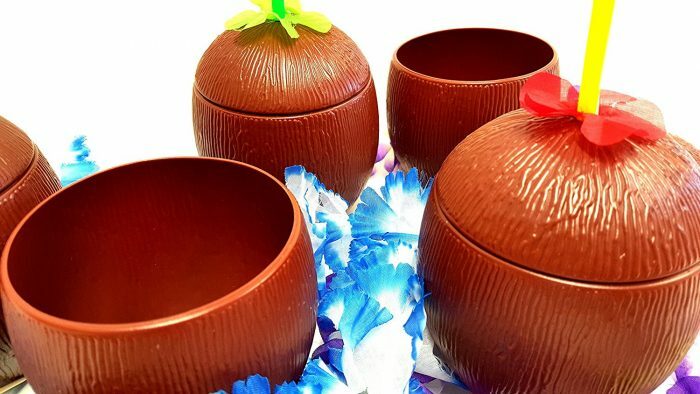 Add a bit of mix and match style with a package of these hibiscus dessert plates and these coconut cups ! 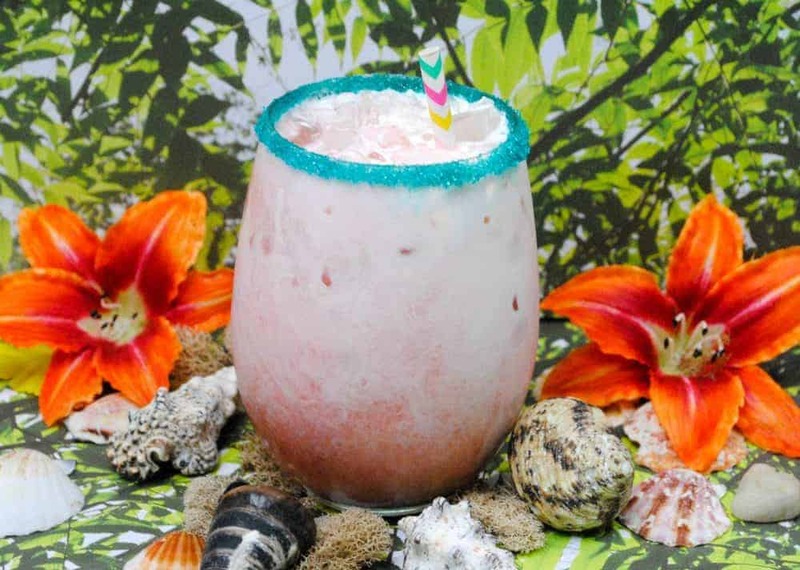 Your local Party City also has an array of Luau themed tableware, including Aloha Hawaiian Themed Tableware, which features bright hibiscus flowers and colorful pineapples; Bright Flip Flop Tableware, which has patterned, vibrant flip flops; Neon Hibiscus Tableware, which features neon hibiscus flowers and Palm Leaf Tableware, which has vibrant prints of palm tree leaves. Tropical Fruit Party Skewers- Grab some skewers and slice up tropical fruits! This idea can double as decor if you stick the skewers into a pineapple! Hawaiian pizza! We love this recipe from Tablespoon. It calls for only 5 ingredients and takes just 30 minutes to make. It’s all about kabobs! Just about anything can be turned into a Hawaiian themed party food if you stick it on a stick! I love this recipe for grilled chicken and pineapple skewers! As for drinks, I say bring on the mocktails! Your guests will love this virgin punch recipe (it’s inspired by Moana). If you want to make your Hawaiian themed party fun and memorable, you’ll need to have some awesome activities and games for your guests to engage in! Queen of Theme Party Games– Hawaiian Luau Party Games- Gives you 13 party game ideas, including Coconut Roll and Hawaiian Fruit Cocktail Bobbing. The Spruce– Luau Party Games- Provides you with ideas for 10 party games, including Luau Scavenger Hunt and Musical Leis. Dolphins and You– Traditional Games to Play at a Luau- Features instructions for 4 traditional games: Hot Coconut, Konane, The Limbo and Ulu Maika. Aloha Friends– 17 Fun Hawaii Theme Luau Games- Provides instructions on fun games like Hula Hoop Charades and Tacky Tourist Relay Race. So, your party is over, and your guests had a great time. Now it’s time to send them home with a cool party favor! Hibiscus Sandal Keychains – These colorful, tropical keychains come in a package of 12. Oriental Trading– Flip Flop Swirl Lollipops- These individually-wrapped lollipops come in a package of 12 and feature pineapple and strawberry flavors. Grab these Pineapple Party Favor Boxes – This set of 12 favor boxes is perfect for filling with pineapple-flavored candies, like Pineapple Salt Water Taffy and Hawaiian Old Fashioned Hard Candy from Amazon. These Plastic Pineapple Tropical Travel Tumblers are a fabulous party favor because your guests can use them over and over. With these Hawaiian themed birthday party ideas, your friends will be talking about your bash for years to come! Everyone will have a blast and go home feeling like they just spent the night in the tropics! Do you have any other Hawaiian themed birthday party ideas? Share below!